I made this as a side dish for dinner this week. 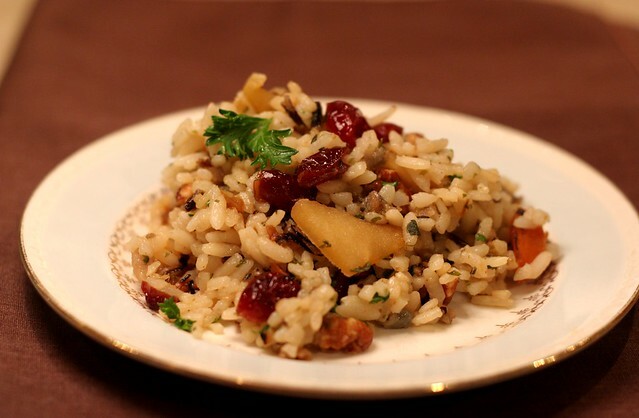 It has such a complex flavor... slightly sweet from the cranberries, crunchy from the pecans and savory from the sauteed carrots. Michael was skeptical when he saw the pecans. He said, "What are you going to do with those?" "I'm going to put them in the rice." (long pause) ... "I'm not sure about that, but I will try it." "Uh huh, sure honey... thanks for being so adventurous..."
How could you not want to taste this? It looks beautiful! I love the bright bursts of red from the cranberries. 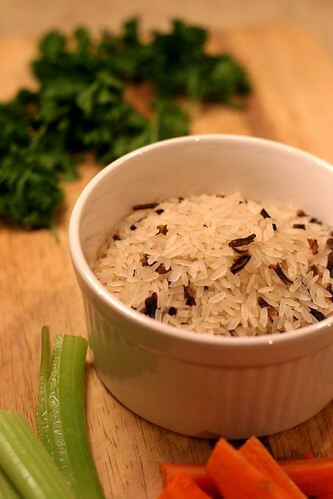 It starts with wild rice, obviously. Cook the rice however you feel comfortable. I made this on Tuesday after a long day at work, so I took some help from Uncle Ben's and used a 5-minute boil rice. You could buy the whole grain rice or even use those little microwavable bags! Whatever is easiest for you, go for it. Just don't use any seasoned rice. 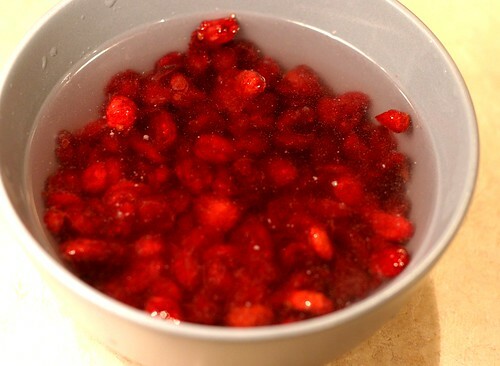 Put a cup of dried cranberries in a bowl. Cover them in hot water. Let them sit while you are making everything else and they will plump up. Plus they will lose the wax texture on the outside, which tastes much better in the rice. Next, put some pecans in a medium sized skillet to toast them for a few minutes. I can always tell when they're done by the delicious smell. After the pecans come out of the pan, add a couple tablespoons of butter. Then add minced onion, carrots and celery. Culinary school lesson of the day: this is called a mirepoix, and is the most wonderful smell ever. 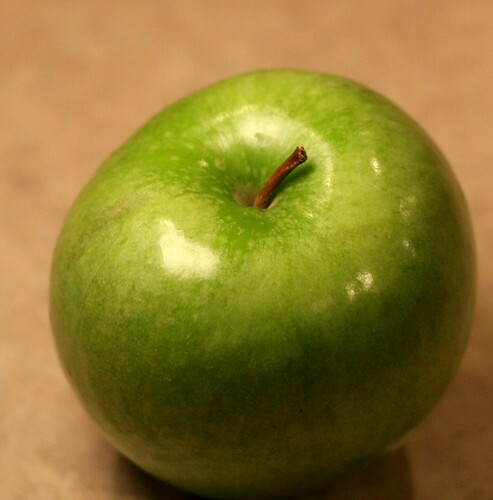 Next comes a granny smith apple. I looooove their tart sweetness. I peeled it, chopped it up, and added it to the pan. Let the apples cook for another 5 minutes or so. The vegetables and the apples will get brown and soft. Turn down the heat a bit and add chicken stock, salt and pepper. Stir it around while the chicken stock reduces. Add the cranberries to the pan and turn off the heat. Pour the delicious mix into your big pot of rice. Then add toasted pecans and chopped fresh parsley. Here's the problem with this recipe: I didn't really measure anything. I just chopped and added whatever I thought would make it delicious. The recipe I wrote down is the best I could remember, so feel free to change it up! Add whatever you would like. Just make sure it has cranberries, granny smith apples and toasted pecans in it. Trust. I think this would be wonderful to serve at Thanksgiving. 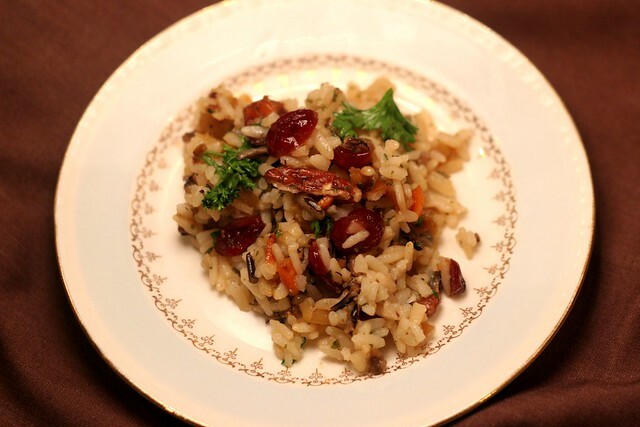 Wild rice tastes so earthy and the cranberries are festive. Oh by the way - Michael loved the rice. He had 2 platefuls. 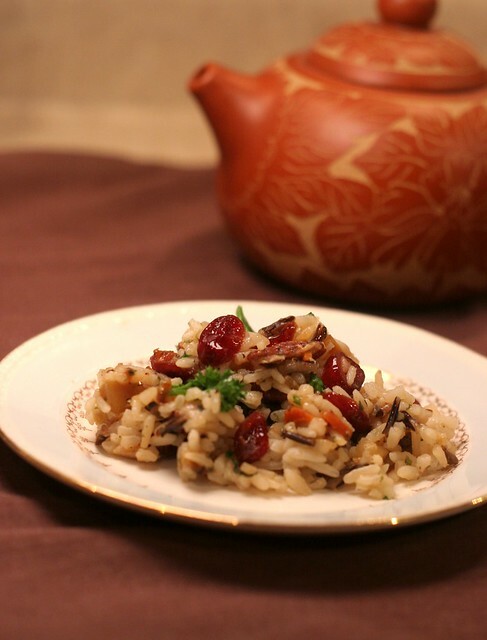 Put dried cranberries in a small bowl. Cover them with hot water and put it to the side. Heat up a large non-stick skillet over medium heat. 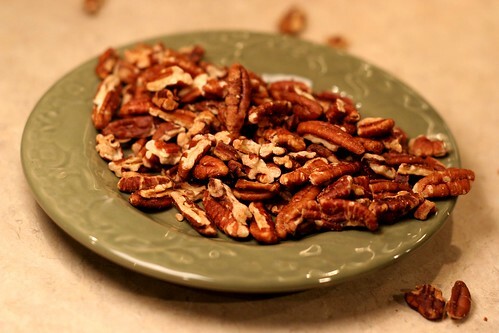 Put pecans in the pan to toast them, 3-4 minutes is all it should take. When they are heated through and their fragrance is released, put them on a plate to save for later. Melt butter in the skillet you used for the pecans. 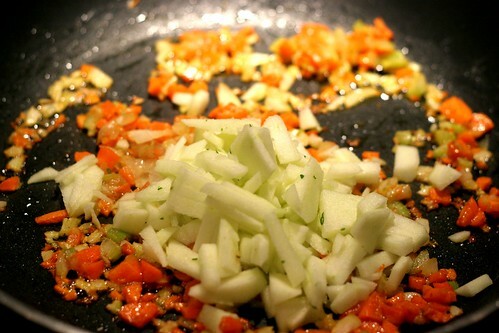 Add minced carrot, onion and celery. Cook for 10 minutes. Then add peeled and chopped granny smith apple. Cook for another 5 - 10 minutes, or until the apples are soft. Season with salt and pepper. Pour in chicken stock, stir, and allow to reduce for 3 - 4 minutes. Drain the cranberries, and add them to the skillet. Remove from heat, and mix with rice. Add in pecans and chopped fresh parsley. Jenna, this looks excellent! I love all of the flavor and texture combinations. This is going on my side rotation list! Wow...this is fantastic. I stumbled upon your blog through someone's FB post, and I'll be back regularly for more delicious recipes! I totally forgot to tell you that I made this for Thanksgiving and it was delish!! Great texture and flavor! Now, that looks like a dish I'd love. It has a lot of my favorites in it.